“It’s emotional because it’s been a long road to get him back.” A teary Tamie Smith gives Mai Baum a big hug after their winning show jump round. Photo by Leslie Wylie. Their hard work paid off today as Mai Baum took the Advanced title here at the 2018 American Eventing Championships presented by Nutrena, clinching the win this morning with a fault-free show jumping round for a final score of 28.0. Mai Baum is the sort of catlike, spring-loaded event horse that looks like he’s manufactured from elastic, and he bounced around the course with apparent ease. 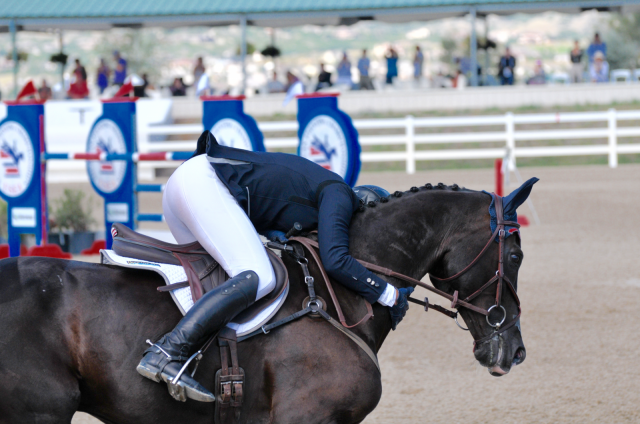 Their trajectory to the win began on Thursday with their leading dressage score of 26.4, followed by a clear cross country with 1.6 time penalties and double-clear show jumping. Mai Baum’s commanding presence turns heads wherever he goes, even when he’s just out for a hand-walk, but his return to the public eye here at Colorado Horse Park was not without some antics. The Advanced cross country course was beefed up with some monstrous tables, and Tamie says he was impressed by the first few jumps — “He jumped five feet over fence four — I was like, ‘Your legs are going to break off!’ — but by the corner at #6 things clicked in and he was back to his old self. Tamie describes Mai as the equine version of Taylor Swift: talented and attractive, basically a perfect human being, yet down-to-earth. “He looks at the camera and poses all the time, and he knows he’s beautiful and wonderful, but he’s not cocky at all,” she says. Tamie and her string are en route from California to the East Coast for the fall. Mai Baum’s next stop is Stable View, with eyes on Ocala Jockey Club as their season finale. Beyond that, she says, she’ll talk to his owners and Erik Duvander about big picture plans. Mai Baum is clearly special and a bright, shining, bubble-wrapped hope for the future of the U.S. team. Jordan Linstedt and Revitavet Capato, Barbara and Gary Linstedt’s 15-year-old Hanoverian gelding (Contendro x Annabelle), held fast to the 2nd place position throughout the week. After posting a 27.5 in dressage, the pair added four time faults cross country and dropped two rails today for a final score of 39.5. Tamie headed on out with Mai Bau, leaving Jordan as the last rider to go. “I think the TD was coming over to tell me pretty much ‘you’re either getting on or you’re not going to go.’ He got the last nail in so I jumped on, jumped the oxer and trotted to the box,” she says. Tamie told the course builders, who worked so hard to get the ground right, that she would give them $1,000 of her prize money if she won. “They had a lot to do on the on the footing out there, and I know they stayed up all night tall night aerovating and working it and watering it, and then we got this torrential downpour which was exactly what we needed. It packed it all in and the footing felt phenomenal yesterday,” she says. Jordan took the summer easy with Capato, giving him some time off when he came up a little bit sore after the Fork then bringing him back at Woodside. Tamie and Jordan both traveled upwards of 20 hours to contest the AEC; while it’s a pitstop for Tamie, it’s a roundtrip for Jordan and her crew, who’ve had a successful week here as well. 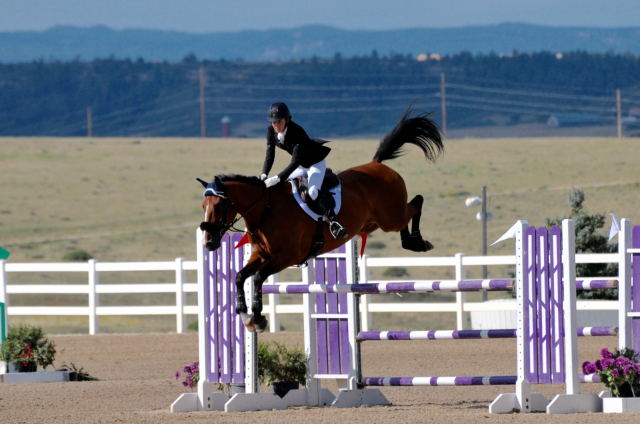 Jordan’s student Madelyn Floyd won the Jr./YR Prelim championship. What’s next for Capato is still up in the air. Jordan really wants to get him to Europe, she’d love to tackle Badminton or Burghley next year, but says that a fall trip abroad for Boekelo or Pau might now be possible thanks to her prize money from the AEC. Rounding out the top three we have Tamie and Fleeceworks Royal, Judith McSwain’s 9-year-old Holsteiner mare (Riverman x Marisol). Hot off a CIC3* win at Rebecca Farm in July, the mare is now on her way to the East Coast for a month of prep before heading overseas to the Dutch CIC3* at Boekelo in October. 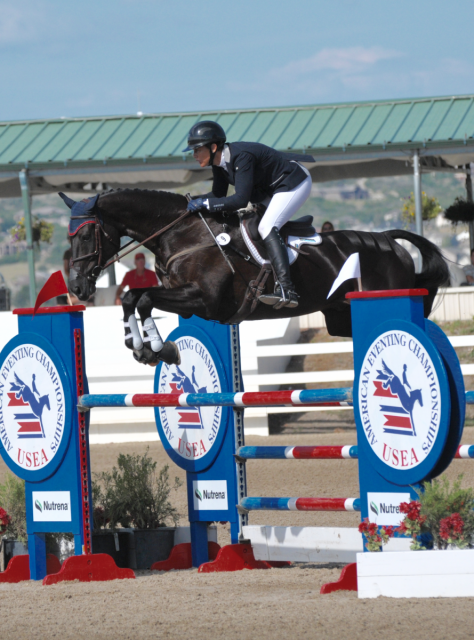 Best of luck at Boekelo, Tamie and Rory! 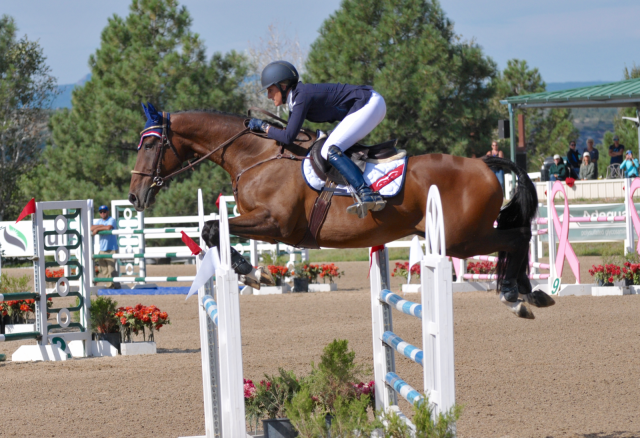 Emilee Libby and Jakobi, her own and Linda Libby’s 9-year-old Belgian Warmblood gelding (Ustinov x Expression, by Coriano), had no jumping and one time fault to finish 4th on a score of 53.6. 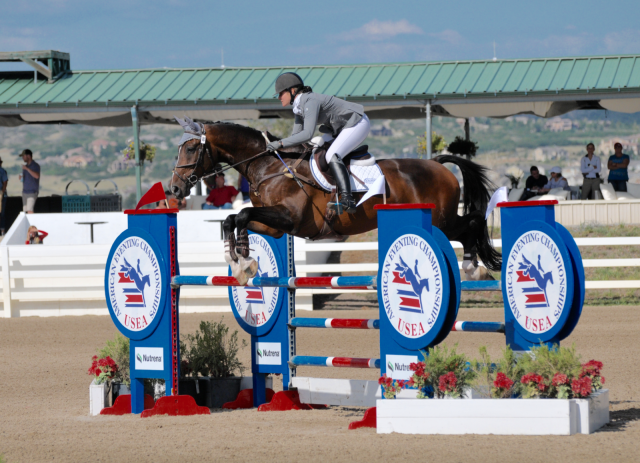 Rebecca Braitling and Soaring Bird, Andrea Baxter’s 12-year-old Thoroughbred gelding, had five rails and three time penalties to finish fifth on a final score of 84.4. Kim Liddel and Eye of the Storm. Photo by Leslie Wylie. 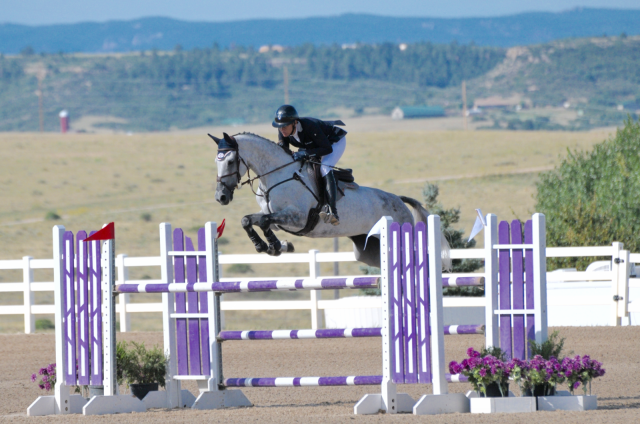 Kim Liddel and Eye of the Storm, her own 9-year-old Thoroughbred gelding (Olympic x Message Of Honey), had six rails and six time faults to finish 6th on a final score of 112.6. More to come this afternoon as the final 2018 AEC champions are crowned here in Parker, Colorado. 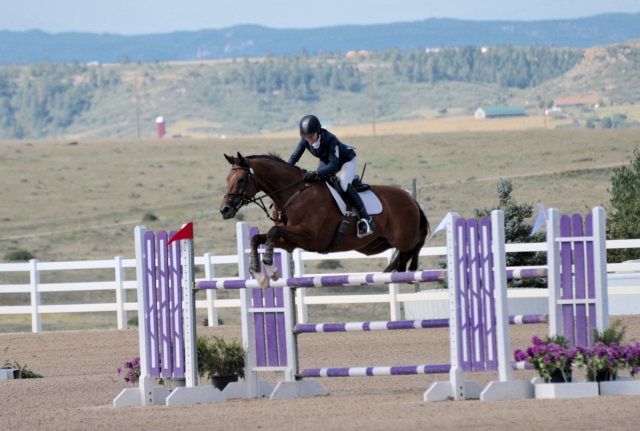 Go Eventing!